HAVING TROUBLE OBTAINING YOUR FAVOURITE SOLUTIONS? and it can be sent direct to you anywhere in the UK. Postage and packing needs to be added which for small amounts is a minimum of £2.95 including VAT. Items are posted usually on the same day if on the list below or two to three days if not, or if a large quantity is required. Discounts are available for greater amounts and credit and debit cards are accepted from anywhere in the UK. Please note that all prices listed below include VAT at 20%. Other solutions and eye products are available, just email with your request. Special items are usually sent out within a couple of days. DO YOU NEED ADVICE ABOUT WHAT SOLUTIONS YOU SHOULD BE USING? Use "All In One Light". Only "All In One Light" kills all Acanthamoeba cysts within the usual overnight soak time of eight hours. 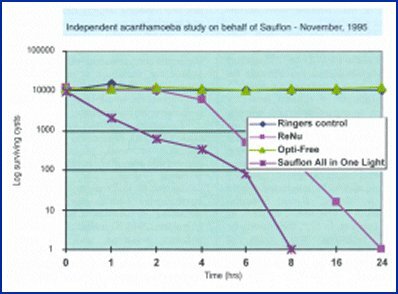 Research has shown that there are as many as 15x more Acanthamoeba cysts on PureVision and Night and Day lenses compared to those on Acuvue contact lenses. These cysts can cause sight threatening infections. NB: Only "All In One Light" kills all Acanthamoeba cysts within the usual overnight soak time of eight hours.